The sun beating down upon us, a light breeze softens the sun’s glare. Not a cloud in the sky. Perfection. As our group enjoys our bagged lunches, made for us by Michelle, the care taker of the farm house we occupy, we rest on a hill trying to absorb the morning’s events. We lay on a berm, directly behind us is a peaceful village. The steeple of the town’s church is all that can be seen. We eat our lunches outside the war monument, Thiepval. The birds singing their songs in the distance is rather unnerving, as they are clearly oblivious to the horror that shook the ground we walk upon but only a century before. We listen to the church bells ring in the distance and our professors begin their lectures. They bring aspects of the war to levels that I have never fathomed. So far, the names that I have read countless times before, such as Ypres and Somme, are now in front of me. Envisioning the carnage and the horror of war is that much easier. Futile charges, desperate counter attacks, and the stories of those buried beneath the pristine cemeteries have finally begun to sink in. The entire group, mere strangers 48 hours before, share a bond that should have taken years to create. However, France has fast forwarded such formalities. This opportunity is truly once in a life time. Every day is filled with a plethora of extraordinary experiences. We have seen more here in the last two days than most people see in an entire lifetime. It’s overwhelming to think we still have three weeks of history to absorb. However, to be among 14 fellow minded historians is a breath of fresh air. The conversations, debates, perspectives and opinions that my peers bring to each battlefield enriches the entire experience to something beyond what I could have ever expected. To be able to take this trip, accompanied by professional historians, has been an eye opening experience. Fellow tourists hear our conversations and realize just how much knowledge our group has. They strain their ears, eager to hear what our tour has to offer in terms of perspective. In the morning we visited Lochnager crater. In the battle of the Somme, mines were tunneled underneath the German lines and detonated before attacks began. This crater was 300 feet wide and 100 feet deep; it could fit a six story building in it. At one point, the crater inhibited the Allied advance because it was so large in size, it was difficult to cross. The British objective was to get across to the enemy side. Many have debated over the military usefulness that this tactic possessed, but none deny the immense magnitude of the detonations. The blast took 26 tons of aminol and a guide told us that at the time it was the biggest explosion the world had seen. It was rumored that citizens in London felt and heard the explosion. Our next stop was at Delville Wood (Devil’s Wood), where the South African cemetery and war memorial are currently located. Dr. Broad had, but a day before, explained how Commonwealth Cemeteries were shaped into the way we see them today. There are over 22, 000 cemeteries in over 150 countries with over 1.7 million fallen soldiers buried worldwide. In France and Belgium alone, there are over 2,000 cemeteries. The South African cemetery and war memorial is often referred to as the equivalent of Vimy Ridge for South African soldiers, and was unveiled in 1932 (four years before Vimy). Similar to the dominion forces, the South African units had to deal with dissention among the ranks. While the Canadians experienced tensions between Anglophone and Francophone communities during the war, the South Africans felt tensions between the Boer and Anglophone communities in a similar respect, further muddying the cohesion that most countries take for granted. While the Canadians welcomed the aboriginals into their ranks with relatively open arms, the South Africans refused to allow black South Africans to serve in any capacity within the units. The most profound memorial I saw today was Theipval, a British Memorial to the missing of Somme. 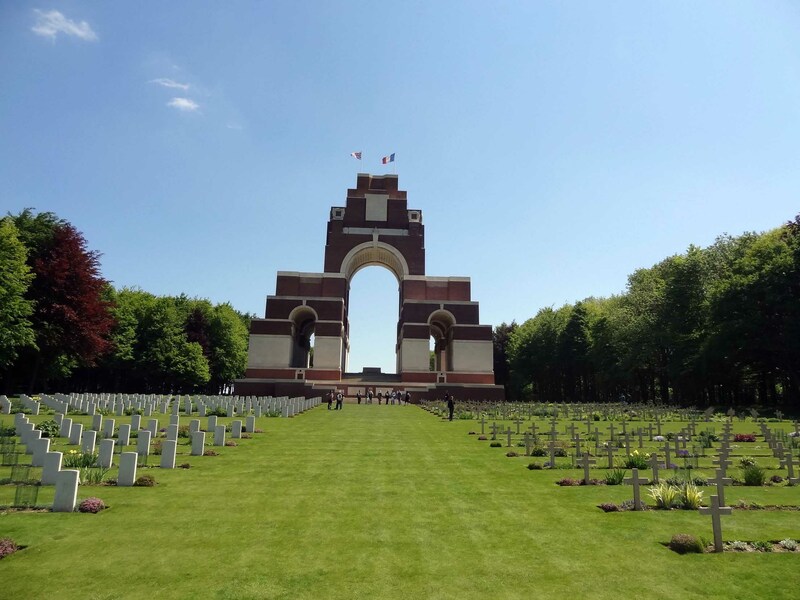 Inscribed in the largest British war memorial are the names of 72,000 men. Although there were no Canadian names etched on the walls, because all of the Canadian missing are on the Vimy memorial, the magnitude of this monument is not lost on us. The weather was perfect, the immaculately manicured lawn was awe inspiring, towering trees provided a peaceful shade. Initially, the view of the memorial is blocked by the trees, but as one turns the corner, the trees separate and are no longer able to cover the immensity of the memorial. A digital camera cannot possibly capture the grandeur the brick monument commands. Unveiled in 1932, it opened initially to mixed reviews. Some felt it was too industrial in aesthetics, but in my opinion, and that of my peers, the monument was incredibly powerful and majestic. From this site, we moved on to a site that hits close to home for us all: The Newfoundland Memorial Park, at Beaumont Hamel. It is famous for the catastrophic casualties that the 1st battalion of the Newfoundland Regiment took after being exposed for an hour. Of the 801 man battalion, 733 were casualties, including all of the officers. The Caribou Monument in the center of the memorial park offers a unique view of the battlefield that cost so many young Newfoundlanders their lives. Walking around the park, seeing the old trenches, compels one to remember the sacrifices these men made. Finally, the day concluded with some downtime at the farm house. There was dinner, dancing, and relaxation as we tried to soak in the day’s events and prepare to do it all over again tomorrow.